Inspired by Students and by Dali! I just returned from Tampa, Florida. A group of us went to talk to a group of individuals from the area who are considering that campus of Dallas Theological Seminary to further their study of the Bible. I was very impressed with their desire to learn about the Scriptures in depth and to apply the Truth to their lives. An extra treat was to sit in on part of a class on Trinitarianism being taught by Dr. Bob Lightner. I took a few classes from him in the early 1970’s in Dallas! I liked how the students were asking questions relating to the process of thinking about getting answers from Scripture rather than simply “What are the right answers.” I hope they all sign up. A highlight of the trip was the Dali Museum in St. Petersburg — a “must see” for anyone in the area. 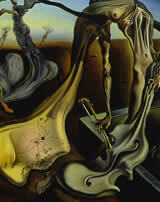 I learned that Dali’s father was an atheist and his mother was Catholic. He led a wild life and, of course, is famous for his surrealistic paintings of melting clocks and embedded images. Our group was wondering whether his works in the 1940’s were influenced by WWII or by his “conversion” to Catholicism in 1940, or by his ongoing struggle to find a basis of hope in the context of disintegration and deterioration. In Spain, a “daddy longlegs” in the morning signified death and despair, but a “daddy longlegs” in the evening (depicted at right) signified hope. This painting was done in 1940. I was most impressed by the new exhibit of The Biblia Sacra in the back room that had just arrived. These watercolors that Dali completed in the 1960’s illustrate events in the Bible that are brilliantly colored, captivatingly meaningful, and respectful of the context of the events. For example, his Vanitas, Vanitatum (Vanity, Vanity shown at left) captures the opulent pursuits of King Solomon with the brilliant colors of his finery but contrasts all that with a most forlorn countenance of the king with his finger pointing upward in a gesture that we interpreted as the resolution of the meaning of life. It is in our trust in a sovereign God that we find meaning and purpose, not in the achievement of our own self-glorifying pursuits. The Biblia Sacra was commissioned by Dali’s good friend, Giuseppe Albaretto. The collection consists of five volumes and 105 lithographs and was published by Rizzoli editions, Milan Italy. Sadly, Dali’s personal life did not embrace as much of this godly wisdom as did his art. You are currently browsing the J. Lee Jagers, PhD, ThM, LPC blog archives for April, 2007.